Once you get used to the idea of yourself as an avatar and an artist (or whatever you choose to be) in the virtual world, you very quickly take it for granted that this is "you", this is how you behave around other Second Life (SL) avatars and this is how you see all things virtual. In a way taking it for granted is a little sad since many of us were and are looking for some kind of new otherness in our experience and creations in SL. But is this really me in SL? On the same note is this really me in real life (RL) when I go to work everyday? Thinking about these questions, I created "I'm Not Here" to be an immersive situation to enhance the avatar’s sense of self in SL through color, light, motion and audio while putting the avatar in the center of the art. When I say “I’m not here”, the work is asking what “being here” as SL avatars is really about. With this in mind, I created two large translucent, light sculptures for visitors to enter in, lose themselves and discover themselves anew as abstracted shapes in color. I also placed audio samples of voices in sculptures throughout the space that get triggered when people walk through them - creating a room size, multi-player musical instrument and echoes of disembodied voices. To further objectify the avatar body as a part of the art itself, I also provide animations that viewers can activate to move their avatars in perplexing ways. At the same time, participants are invited to take snapshots of themselves as colored silhouettes and post the photos to become permanent artifacts and a lasting part of the experience. I've taken countless images in the two light space-sculptures since I first rezzed them two years ago. One of the ideas of this installation is that the art functions on many levels: virtual installation and space, 2D photos taken within the spaces and shown on the wall panels in SL and more recently as part of Boston Cyber Arts actual prints of the images shown in the RL gallery at CounterpART. If people buy some of the prints, they will be hung in their homes and this will be another layer. All of these are experiences in themselves and raise such questions as what is here and now, what is art, what is this experience I'm having right now? 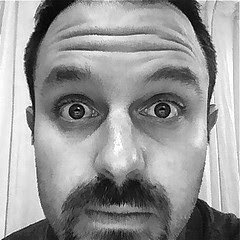 I suppose I should use this blog post to introduce myself or should I say ourselves. I am Juria Yoshikawa and I arrived in Second Life in the winter of 2007 looking for a new artistic spark. Rather than bringing in rl artwork, I felt compelled to use mainly the elements that make up SL itself. A typical virtual artwork of mine mixes kinetic objects, animated texture, repurposed lsl script, ambient noise and av animations. I also usually work in large scales because I am interested in people experiencing the work in a physical way - flying through them, riding on them and socializing within the art. I especially enjoy remote collaborations between musicians, coders, curators from around the world who are brought together in the virtual space to create a new genre of artwork. 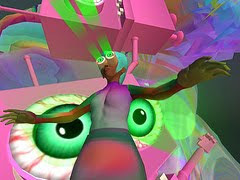 In my real life, I am also Lance Shields, a Tokyo based new media artist and designer. I have spent many years making digital art, installation art and performance. Sculpture and installation are where I started my creative career but I became progressively more involved in the digital and interactive. I see Second Life as a return back to my artistic roots yet at the same time combines my newer interests in the phenomenology in the virtual world. I chose to be a female avatar (after a short stint as a male avatar) not so much to be a part of the sexual dynamics in SL but as an experiment in creating a completely new persona as well as learning to make art from the point of view of a female. Juria is actually part of the art herself, often times wearing the art and appearing in many of the photos and videos I take of the art. In the end, when I'm making art in SL I'm clearly both Juria and Lance. Do I get lost at times explaining whose work it is and what sort of person is behind the work? Yes, I do. But I also with little hesitation accept this layering of identity and world views and just want to keep making art. I may not be here but someone sure is. My work has been exhibited and supported inworld at IBM sim, Princeton University sim, Visions of Global Justice (UCLA), Kennesaw State University, Brooklyn is Watching (Jack the Pelican Presents) and in RL at the Directors Lounge Festival in Berlin. If you want to check out some great electronic music tonight, the Slosberg Music Center at Brandeis University is the place to be. The intimate venue will be the scene for the Electro-Acoustic Music Studio (BEAMS) Electronic Music Half-Marathon. “I’ve been playing music since I was four years old,” says featured artist James Borchers, “ever since my parents bought me a sears drum set.” A Nebraska native, Borchers moved to New York in 2001 to study music. While he still enjoys percussion, he admits that composition is his first love. An incredibly versatile musician, Borchers has composed pieces for orchestral and chamber music, electronic music, opera and music theater. He’s performed at the Storm King Music Festival, Bang on a can marathon, Ballet Hispanico, New York Youth Symphony and the New Amsterdam Orchestra. “Tonight I’ll be performing Composed Improvisation,” says Borchers, “it’s a piece using the tabla and a laptop. The actual notes are not written, but the piece is fairly consistent at each performance. The laptop responds to different sounds the tabla makes.” The Tabla is a popular Indian percussion instrument. Guest artist Charles Dodge will start off events at 4:00 p.m. with a lecture on his extensive work in the field. One of the first musicians to use synthetic voice manipulation, his 1972 composition Speech Songs is considered a computer classic. Dodge’s award winning work music led him to co-author book Computer Music: Synthesis, Composition and Performance, a well-known textbook on electronic music. He’s also the founder of the Center for Computer Music at Brooklyn College of the City University of New York. At 8:00 p.m. the Slosberg Music Center audience will be treated to Any Resemblance is Purely Coincidental performed by Sara Bob and for Baird, etudes for violin and electronics performed by Krista Reisner. The lineup will continue with James Borchers, Christian Gentry, Peter Lane, Travis Alford, Yohanan Chendler and Brandeis Professor Eric Chasalow. The marathon is taking place in conjunction with the April 22-26 Leonard Bernstein Festival of the Creative Arts which features plays, concerts and art exhibitions. All events are free and open to the public. The marathon will be held at the Slosberg Music center, Brandeis University Brandeis at 415 South St in Waltham. Call 781/736-3331 for more information. At Processing Time you can: Compete individually or in pairs to design and develop beautiful programs in Processing. Snack and refresh yourself. Present completed projects to other participants and visitors at the end of the day. Anyone (not just MIT students or community members) can compete, anyone can stop by to see presentations. Meet the creators of Processing, Ben Fry (in person) and Casey Reas (via video), who will give awards. Last week, I sat down with Nick Montfort, the organizer of Processing Time as well as author, editor and professor at MIT, to talk about the event. MCE: Why did you decide to organize Processing Time? 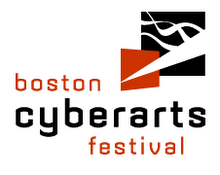 NM: The long answer is that my involvement in the Boston Cyberarts festival started in 2001 with this event called the Boston T1 Party, an electronic literature reading that we put on with eleven authors and nine different works in the main auditorium of the Boston public library. I think it’s probably the most successful public event outside a university or some other similar context as far as drawing in people to see what electronic literature was like. It was a great event in many ways. Once I came back to the Boston area, I knew I wanted to participate in the Cyberarts festival again and organize some sort of event. I started to think about what might work well from the standpoint of MIT's engagement with the arts, as well as things that weren’t otherwise represented in the Cyberarts festival. Electronic literature would certainly fit the latter category; as far as I know there isn’t going to be a reading this year. But one other thing that seemed to be missing from the festival was events that looked at how computation was aesthetic, how it was a part of art practice. Obviously, we use computation in almost any sort of digital work, not something on a DVD but anything that is on a computer. And that is not the element most often foregrounded -- it’s the visual element, it’s the interface. But how it is that a program could function in a beautiful way, could do something interesting -- that was pretty intriguing. So, thinking about these things, talking with Leila Kinney, who is the Director of Arts Initiatives here at MIT, it seemed like it would be nice to have a party, a coding session, a competition--not like an in ACM programming contest sort of way, but more in the sense of the Interactive Fiction Competition or various other competitions people hold online. That is, where a community interested in a particular type of coding practice in digital media form gets together, does these things, shows them to each other and appreciates what they’ve done -- and has fun. MCE: Have you, yourself, made any time-based work in Processing? I’m also interested in clocks as functions. You want to map the time, which you have as an input, to an output, which could be sound, could be text, could be visual. When you build a clock, you’re doing something you can’t do in Illustrator. You’re actually creating this mapping between what you see and the time as it is represented in your computer internally. I should say that also, to give us something to do, we’re going to start off and say ok, ‘build a clock.’ But some people’s programs may have the display of time as a rather incidental thing, and they may do a bunch of other things. We’re not restricting anyone from doing anything else. But in order to have something that all of us that afternoon are working on in common, we’re all going to throw that out there. MCE: During the presentations, are people going to be encouraged to show their code? NM: Encouraged or required! I think that the point is to see what beautiful programs are like. So, when you run them, you see what you do. But you’d also like to be able look at code and see how they are written. MCE: Should people know Processing if they want to come? NM: They should either know Processing or bring a teammate who knows Processing. We’re not having an introductory workshop or training sessions. But we did want to accommodate people who have an interest in this type of work, who want to come and be part of the event, but their knowledge of how to program Processing was limited. The way we thought to do this was to have individuals allowed to compete, but also pairs of people. MCE: A coding party. It’s awesome. Any words of encouragement or final thoughts? NM: A lot of people want to come and watch and see the results and that’s great. But people should come compete also! We have some people signed up already, and we’d like to get more! For more information, go to http://burgess.mit.edu/pt/ or download the .pdf.